The demolition and re-construction of a commercial building near the Boca del Rio Park has raised concerns regarding possible irregularities. The size of the building being erected has residents wondering if the project is following proper building regulations, as it appears to be right on the edge of the street. Furthermore, the improper disposal of construction waste has raised such concern. 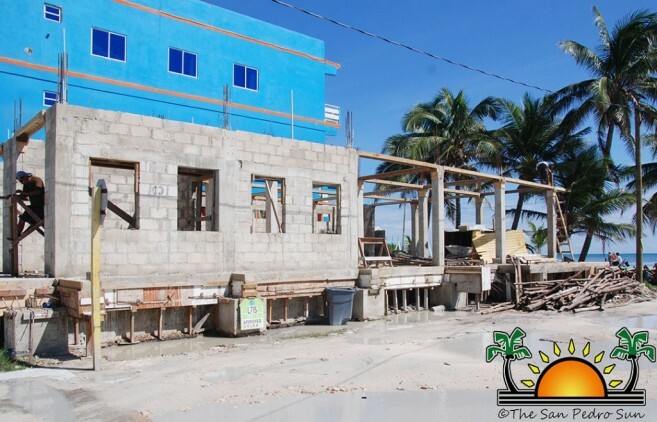 In April of this year, the Ambergris Caye Building Authority (ACBA) introduced strict construction regulations and demanded that any new commercial buildings must allocate parking areas. According to Fidel Ancona, in charge of the ACBA, the building regulations demand that any construction leave a space of five feet on two sides of a structure, with a minimum of ten feet at the back and eight feet for parking in the front. In regards to the construction at the Boca del Rio area, Ancona told The San Pedro Sun that it was approved as a renovation project. “The original building used 100% of the land,” said Ancona. “The new building will leave parking space on the street that leads to the beach.” He assured that after the inspector assigned by the ACBA reviewed the project and visited the site, all works are being done on the privately owned property. According to them, the new construction has met all the requirements and is even including additional space for parking. As to the disposal of construction waste reported, that was addressed immediately. According to Ancona they do not tolerate such practice. Residents reported seeing piles of used cement bags, and waste from the demolition which included large chunks of concrete and of iron bars, piles of wood and other construction debris near the basketball court and around the community park. They are assured that this behaviour will be strictly dealt with, and the proprietors warned. Failure to clean up could put construction on hold. The ACBA assures the community that it will continue monitoring developments on the island. According to them, they are committed to watch closely how the island develops and ensure that all regulations are being followed.